This is not a cry for help. I repeat, this is not a cry for help. At least not for now at this very moment. Starting back when Lori and I did our iPhone sew-along (Lori’s, mine) with Ayumi’s Lunch bag (purse) pattern, I have not been able to stop making them or stop thinking about making them. 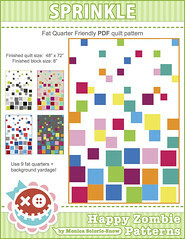 I see fabric and all I want to do it harvest a small collection that would make for a cute lunch bag (or as I lovingly call them now: Ayumi Purses). This last Saturday I made two more. I couldn’t decide which Suzy Ultman Appleville brown or Appleville white to use, so I made both. BOTH! Paired with some of Tula’s Prince Charming and Robert Kaufman’s “ring” fabric - it would have been criminal not to make both. It was a sewing-day with the Portland Modern Quilt Guild, and if I hadn’t spent so much time proclaiming (proclaiming = When Harry Met Sally deli scene) how cute the pattern and the fabrics were together, I might have even been able to crank out an additional bag. That’s Susan waving hi - she’s so dang squeezably cute! And that unusual bright light emanating from the window in the top right of the photo - that’s sunshine people. Sun. Shine. Dispelling all rumors that Oregonian’s are Mole People. Fact. I’m playing with making the lunch bag bigger, so I decided to go all Scarlett O’Hara ish and use the (Darlene Zimmerman Mama’s Kitchen) fabric that was once my sewing room’s closet curtains at my previous house. 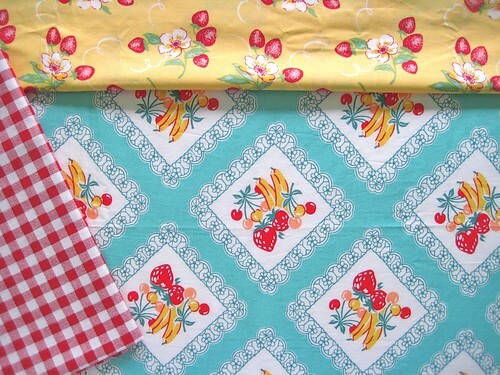 I love how Lecien’s red check from their Color Basic’s collection goes with Darlene’s fabric! Cutting and sewing next up (and fingers crossed my upsizing hacks work out). As soon as I got wind that Michael Miller flipped the switch on the way-back time machine and was bringing back Patty’s Andalucia - I flew over to the Fat Quarter Shop and ordered me some of the Andalucia II. 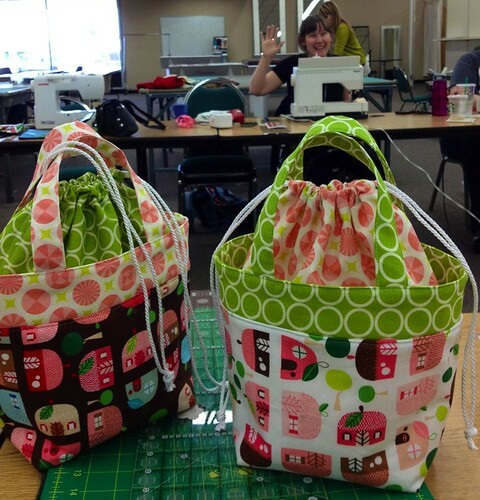 The bags are terrific……may have to make one……or two….or more. They are ardorable…I hope you carry your lunch often so that you get to use them all. I know exactly what you mean….I have made 3 so far. They made great Easter baskets for my daughters (2 of them) and one to hold a birthday gift. I can’t stop either! LOL…you are so funny!!! 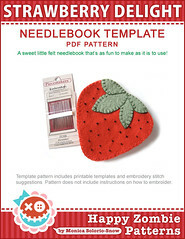 I am making them this month for my Christmas Through The Year project…let’s see if I can stop at two …. I may be contacting you :-)! You’ll have to try harder, I don’t think it is really the sun. 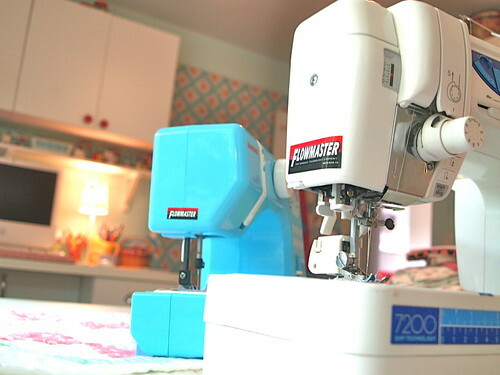 I’ve seen how you photo shop your pictures :) Happy sewing! Love your fabric choices! Well I have not moved on to lunch bags but I did just finish cutting out a Taking Turns! Lots of Monsterz, a little FMF and pile of other sweet things, I am off to sew. I am using a white jelly roll, I haven’t done the math but I’m hoping it works out…lol! 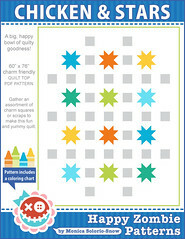 Love that argyle/check in the last pic! Just might have to get me some of that! Those Appleville bags might just have done it. I feel this thought creeping in..that I need a bag like this. The bags are wonderful. It is not an obsession if you are making them for a purpose - even as a go-to gift. Also, have you considered offering them to a local charity - we have a group here that supports abused children that make bags for holding toiletries and these would be marvellous for that. Just a thought. Listen, since you’re on a roll, would you make one for me too??!! Just kidding. I hear ya…and any chance you can share the cutting chart for the larger bags. I am NOT obsessed, I am NOT obseesed. Oh well, maybe just a little!!!! Um, I’m addicted… I’m not even going to say how many I’ve made or how many I still plan on making. This is one of the most fun projects I’ve made in a long time. I too am considering making a larger size. I’ve also been using vinyl fuse on some of them. Love, love, love vinyl fuse. LOL oh she’s supposed to be waving. I thought she was photobombing your lunch purses ;-) bahahahaha…. so good to see Mimi out and about! I LOVE Auymi’s lunch bag and have favorited it….you have inspired me to sit down and make one! Your’s turned out super cute! Auymi, like you, is so generous with her tutorials. Thank you both for sharing. I am dying to make one of these in a few weeks. I am just trying to decide on the perfect fabric. It will be a mini “congrats on making it through law school without killing anyone” present and lunch bag for my new job. Gosh Monica - those bags are soooo cute! I can see why you needed to make both of them! 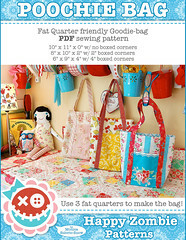 I hope you have a lot of quilt events coming up so you can use all your pretty lunch bags. Almost (operative word here) makes me wish I was still working so I could use a lunch bag again. Oh well… maybe someday for a senior retreat? Too good not to be addicted. They look lovely! Dang. Now you’ve got me wanting to make one of Ayumi’s bags. A friend gave me some fabric for my birthday and that pattern might just be perfect for it. I might use the bag to hold my knitting instead of my lunch though. We Seattle mole people were thrilled to see the sun too! Monica, you are the funniest person! 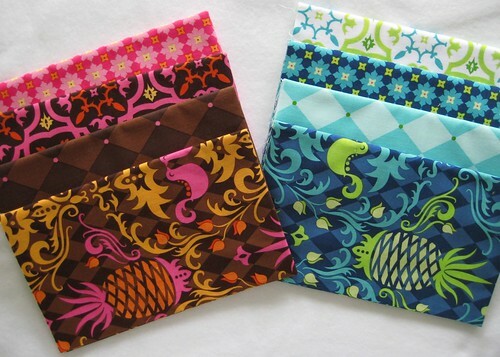 It was a great sew day and I just love your Ayumi Purses! 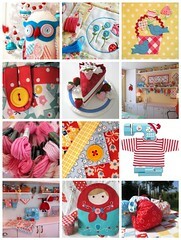 Love the Micheal Miller fabrics too! i just saw you on the newsstand again! 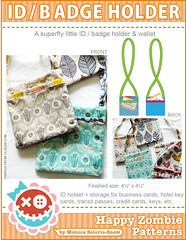 in the back of better home and garden’s “all small” magazine with your tiny little bags! 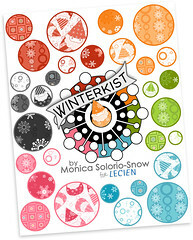 I follow your blog and Lori’s blog..seen the tut when you made them, as of yet I have to make some, when I see the ones you just made I can’t wait..off to buy some fabric.. I have made two of these adorable bags so far and already have the stuff to make 2 more sitting on my sewing table! They are beyond cute and super easy, love them! I recently made two of these totes and love them. They are so adorable. 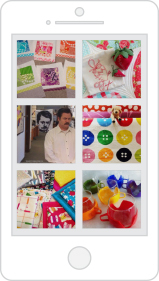 Hi Monica, I can’t believe how behind I am in my blog reading–looks like I’m two whole fabric lines behind with you! And here I thought I had been busy! Anyway, I just wanted to let you know how much I love your color and design choices. You really are such a “super-star”! Those are so adorable but then anything you make is adorable!! Those are addictive for sure! Those bags are precious! I remember yours and Lori’s posts about the Ayumi bags. I pinned Ayumi’s bag a long time ago when she first made it and have been wanting to make it! You have given me the extra incentive that I needed. Now to just find the time…..Your blog is so cute!! I love those bags so much that I made them for my Bunco group. They all seemed to appreciate them. I have one that I use for a little project bag. I’m retired so I don’t get to take a lunch many places but this bag almost made me want to go back to work. Thank goodness I got over that! Ive been thinking of making a larger bag, too. But that’s as for as I’ve gone on that project. Oh Monica! You are the reason why several people have contacted me about the tutorial again recently! You seriously make the cutest lunch bags and it just makes me so happy to know that you think about making lunch bags often now ;) You rock! Hmmm, do I detect a hint of a giveaway? Even if you werent thinking it before, maybe I’ve planted a seed? Like Inception? Make more and send them to Jayme! And p.s. this is only a dream in a dream in a dream… Hehehe!!! You are not alone! I have made 9 so far and I keep thinking of fabric combos for them. They are just so darn cute. Everytime I finish one I dance around squeeling “this is the cutest one yet” and my poor husband looks at me and says, “yep, the cutest one yet”. 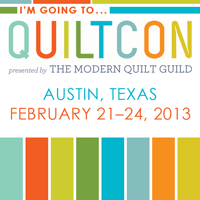 Please let us know if you figure out the measurements for a bigger one….I would love to make that too! I don’t have a sewing machine, and even if I did, I could not see:(((( but I want a baggggggggg!!!!! Who will make me one??? Is anyone selling? I haven’t made one yet but have thought about it more than several times. Maybe if you gave me one of yours for a little hands-on inspiration, I’d be a little more inspired. Yes, I think that would work. oh, you talented woman you!! 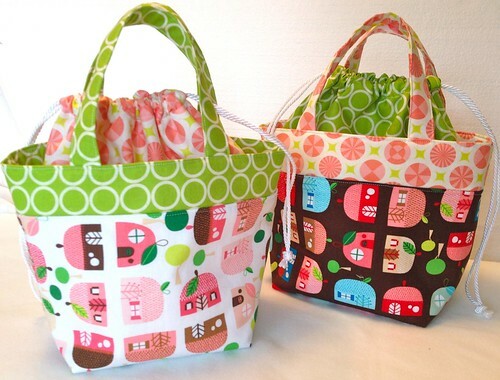 These bags are adorable..and the fabric combos are great. I wish I could get excited about something, and really turn out the darling things you do…since my pillowcase marathon, I’ve been kind of lacking in enthusiasm. Maybe this week it will all come rushing back. You inspire all of us, keep it up!! This bag is so completely addicting. I made like 40 of them for a Dance Team fundraiser. And it didn’t even take that long..assembly line! 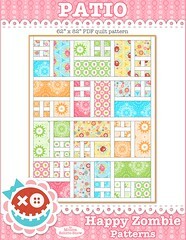 :) I’m tackling another Weekender for Nisa in the next day or two..yippee…I LOVE, LOVE, LOVE the fabrics you used. I am so addicted to these bags from the last time you posted about them! They are just so fun to sew and so darn cute. Love them! Hope you share pics of your bigger bags soon. I made one the last week in my quilt group, it is so cute, many pink for my two years old Ana. And now all the group will do one this week. It is a easy, fast and pretty proyect. I anderstand you. 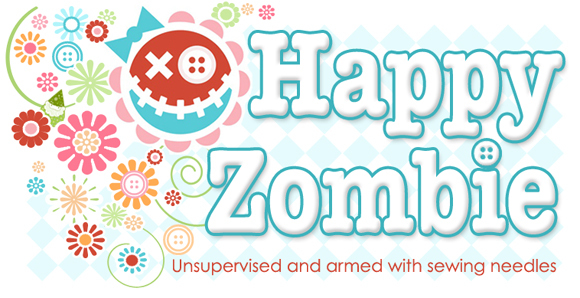 And I love your work, and the little zombie.